Do you know those beautiful chrysanthemum flowers blooming in your garden, are a storehouse of health? The warm beverage that is prepared by using the dried chrysanthemum flowers reflects the beauty of the flower with its floral fragrance and fresh aroma. Regarded as an amazing Chinese medicine, Chrysanthemum tea works as a natural coolant. This golden brown tea contains high amounts of B carotene that is converted to Vitamin A in the liver. Consuming this herbal tea is beneficial, especially for women. 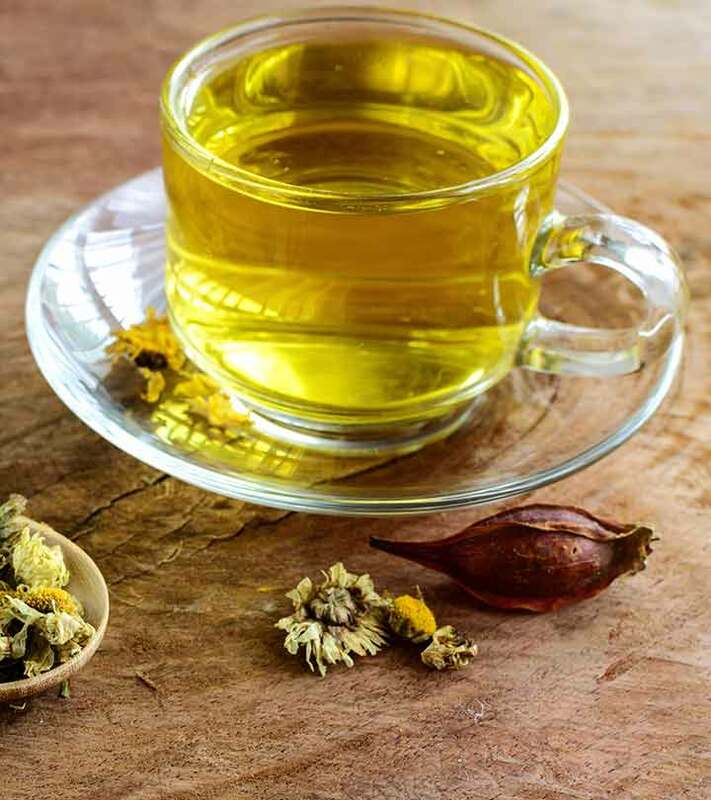 Chrysanthemum tea makes you feel refreshed and rejuvenated after a day of hard work. With its flavor and taste, it relaxes the body and mind. To treat itchy throat and cough, chrysanthemum tea along with Fructus Momordicae, should be soaked in water for 20 minutes and then boiled. Lemon and rock salt can be added to the tea for flavor and taste. Green paste tea can also be mixed with this tea to remove heat from the liver and improve the eyesight of a person. This combination also provides relief from eye fatigue. This brew can also be consumed to reduce sleeping disorders. The used flowers can be used later to reduce dark circles around the eyes. 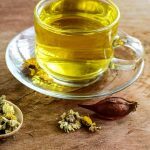 As the tea mainly comprises of about 45% dried flower extract, it is useful in treating inflammation in the lungs and nasal passages. It is also known to have anti-fungal, anti-bacterial, and anti-viral properties and is effective in cleansing the liver. This Chinese chrysanthemum tea is caffeine free and does not cause any side-effects like tension, nervousness and irritation. It is useful in the treatment of coronary artery disease, varicose veins and blocked arteries. It has effective stimulating properties that alerts the senses and rejuvenates the brain. Drinking this tea helps to provide relief from conditions like sore throat, itching sensation and reddishness in the eyes. This transparent yellow color tea acts as a good detoxifying agent for the liver and helps to reduce the cholesterol levels in the body. Chrysanthemum tea is not used widely as other herbal teas. That’s a pity because this is one tea that packs a punch when it comes to taste and flavor. The flavor of this tea is a little more subtle and less bitter than green tea. You can brew a cup of chrysanthemum tea by placing about 9 grams of the dried flowers of chrysanthemum and half the quantity of dandelion flowers in a teapot. Add some hot water to tea pot and soak the tea leaves for 5-10 minutes. And your tea is ready! You can add sugar according to your taste. As the flower contains alantolactone, it causes skin problems like redness and inflammation of the skin, and itchiness. People suffering from diabetes should not consume this tea as it interacts with insulin. Sometimes, its sedative properties are responsible to lower the blood pressure level of a person. Apart from these minor side effects, chrysanthemum tea can be an effective addition to your evening tea time! If you have guests coming over, regale them with a perfectly brewed cup of chrysanthemum tea. Not only will they appreciate the taste of this flavorful beverage, but will also thank you for a dose of health! Have you ever tried chrysanthemum tea? Did you like the taste? Do you think it tastes better than other green teas? Share your views with us in the comments section below.